You’ve heard of sleepovers at the Natural History Museum for children, but now one zoo in France is offering a whole new sleep over experience – with polar bears. 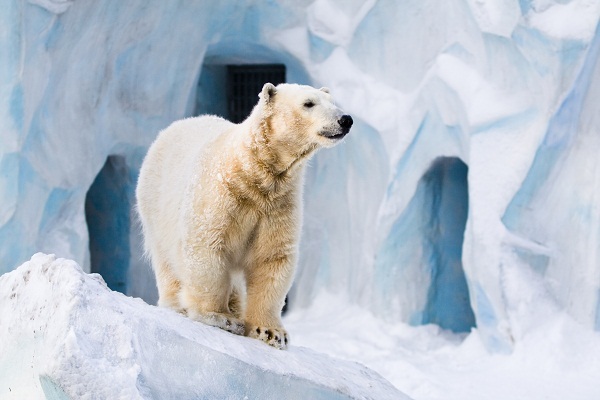 La Fleche zoo in the Loire Valley (France) are offering visitors the chance enjoy a glass of champagne and gourmet dinner whilst staying in one of eight arctic themed three star cabins, with only a pane of glass separating them from the polar bear enclosure. Visitors can get up close and personal to the two beautiful carnivores, named Taiko and Katinka, who often touch and swim right up to the window to size up their new neighbours. The zoo launched their ‘night with the bears’ idea in October 2014, and have already filled the rooms until the end of 2015! The concept has proved so successful, that a further six cabins have been planned with a Savannah theme – so perhaps a different animal will be available for sleep overs by the time they are finished in 2016. If you’re wondering how much a zoo sleep over costs, the eight cabins charge £157 per person per night, and up to eight people can stay in each cabin. La Fleche isn’t the only zoo to offer families this type of experience, Sainte-Croix (also in France) offers visitors the chance to stay in a deluxe wolf lodge. Furthermore, The National Zoo in Canberra (Australia) has recently opened a new resort which offers guests the opportunity to have a bath next to bears and sleep with sharks (behind a glass panel of course).